Don't over cook Brussels sprouts. Steam lightly and they will be bright and tasty. Dovetailing Tip: Steam an extra pound of Brussels sprouts. 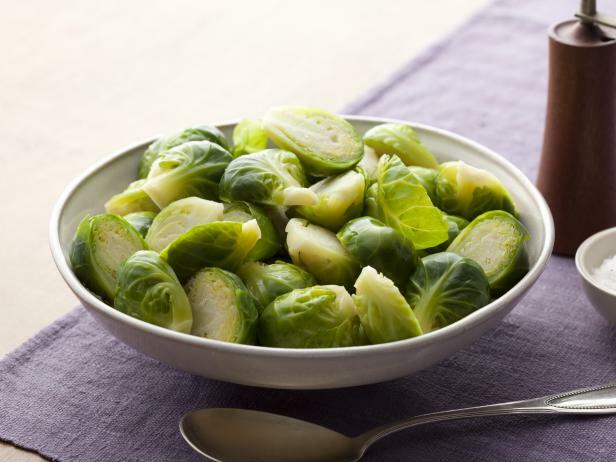 Save to use for Meal 4, Stir-fried Brussels Sprouts. Cut off the stem end of the Brussels sprouts and remove any yellowing outer leaves. Cut each Brussels sprout in half from top to bottom. In a steaming pot, bring water and salt to a boil. Place the Brussels sprouts in the steaming basket and cover. Place over high heat and cook for 5 minutes or until tender. Remove and serve immediately. Top with butter, salt and pepper.